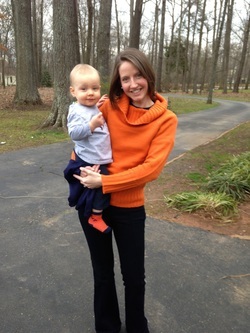 Kendall Wolfson is a "Double Hoo", graduating from the University of Virginia’s McIntire School of Commerce in 2005 and completing her master’s degree in Social Foundations of Education at the University of Virginia's Curry School of Education in 2010. She and her husband Jonathan, an alumnus of UVA Law School, live in Richmond, Virginia with their family. The character "Junior" in the book was inspired by her first child, Jonathan Adam Wolfson Junior. For more information on the story behind the book, visit the Blog CavMan and Junior's Journal.